Good things are happening in Colorado, under Gov. Bill Ritter's leadership. In April 2007, United Way made it possible for a pair of foster care youth to shadow the Governor during "Take Your Child to Work Day." 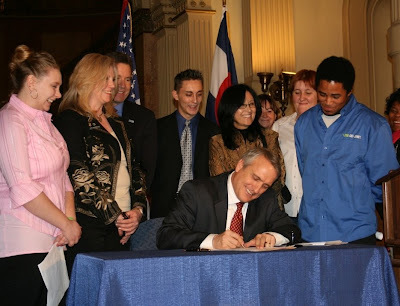 In February 2008, Governor Bill Ritter signed into law a bill requiring counties to arrange visits between foster children and their siblings if they have been separated and want to stay connected. But with progress comes inevitable setbacks. The Colorado Task Force On Foster Care and Permanence was created to address problems within Colorado's foster care and adoption systems. The intent of the task force was to include foster care youth, biological parents, foster parents, as well as child welfare professionals. After all, round tables discussions don't work unless the key players aren't invited to the table. Nor do they work if the time, date and location of task force meetings is not publicized. This is awesome, Lisa... Thanks for posting.